The Birdie Buffet is bursting with enrichment for your medium sized bird! 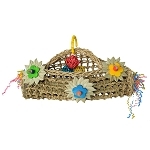 Inside the basket you’ll find vibrantly colored popsicle sticks, loofa, raffia tassel, vine twist, and banana leaf rolls. Your bird will relish all these foraging and pecking options! 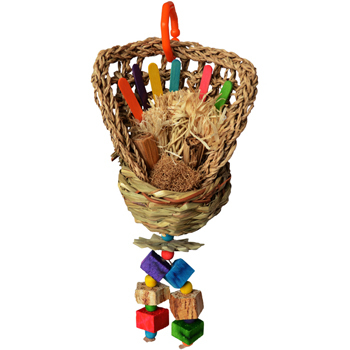 Hanging below the basket is a double string of chunky wooden blocks, mahogany chips, smooth wooden beads, and a palm leaf flower for your bird to twist, pull, climb, and hang on. 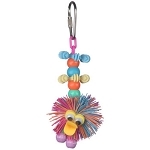 The Birdie Buffet is an awesome foraging toy! It has almost a dozen textures & shapes for birds to explore. They can move the popsicle sticks with their feet or beak, but they’ll have to figure out that moving the loofa might need both! 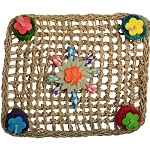 The raffia tassel is easy to shred, but the pine blocks are a challenge to tear apart. 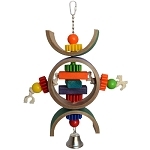 The variety offered by this toy lets birds problem solve and manipulate to their heart’s content!